What can I do to help me run longer distances? I’m asked this question ever Spring. As marathons and races come into full swing it’s important to know your limitations and also, to learn how to break through your physical boundaries. Here are a few techniques to help you go that extra mile. 1) Decrease your speed. A slower speed will help you conserve energy so you can push to a further distance. Slowing your pace may seem difficult at first, but you will adapt and reduce the chance of running out of energy. 2) Set goals to motivate you. Short term and long term distance goals will keep you moving forward. If you are training for a race or marathon, break the distance down into smaller goals and gradually increase the distance. 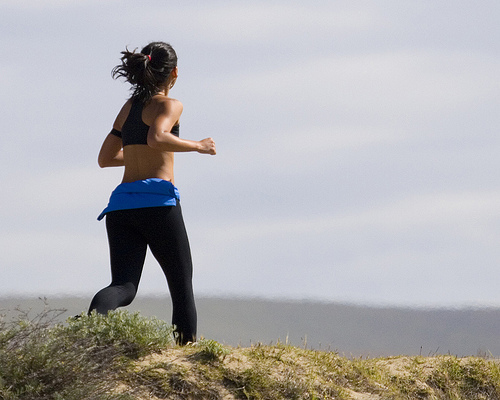 3) Space out your long runs. If you attempt long runs too close together your muscles will not have sufficient time to heal and you risk injury. It is suggested that you do one long run a week, if it is less than ten miles. Every other week for distances greater that 10 miles. 4) Get to the gym and do some weight training. Strong muscles make physical activity less demanding and will help lengthen your stride without increased exertion. There is no one trick that will help you run longer but a combination of these tips will improve your stamina and technique so you can reach your performance goals! Happy running!